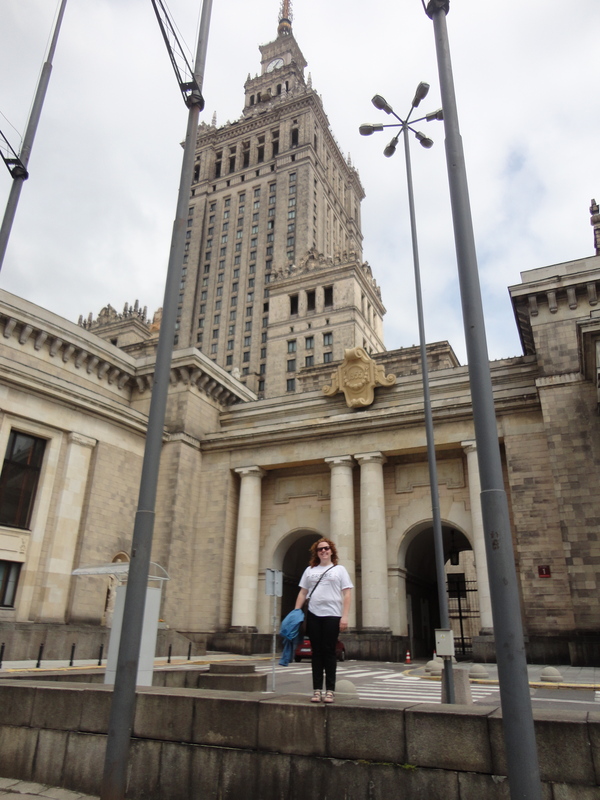 All of us American fellows got to Warsaw throughout the day on Friday. We got to our hostel and some crashed from jet lag at first, but we all managed to go out to dinner and explore Downtown Warsaw a bit. I’ve come to Poland knowing almost nothing about Polish history or culture. So all of my observations are without context for the most part and all my first impressions are almost certainly wrong. In the back is the (HUGE) Stalinish-era Palace of Science and Culture. It’s surrounded by a host of more modern buildings. and most of the remaining percents are other European ethnicities. I can probably count the people of color I’ve seen on two hands and maybe a foot. I know this is something we’ll talk about throughout the program, so I’m quite interested to find out how/why this is. 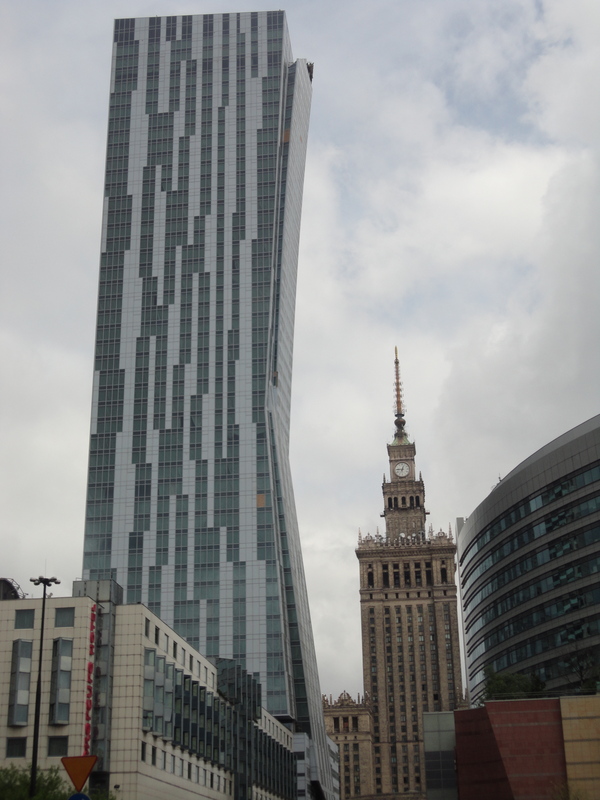 Architecture in Warsaw is very interesting. 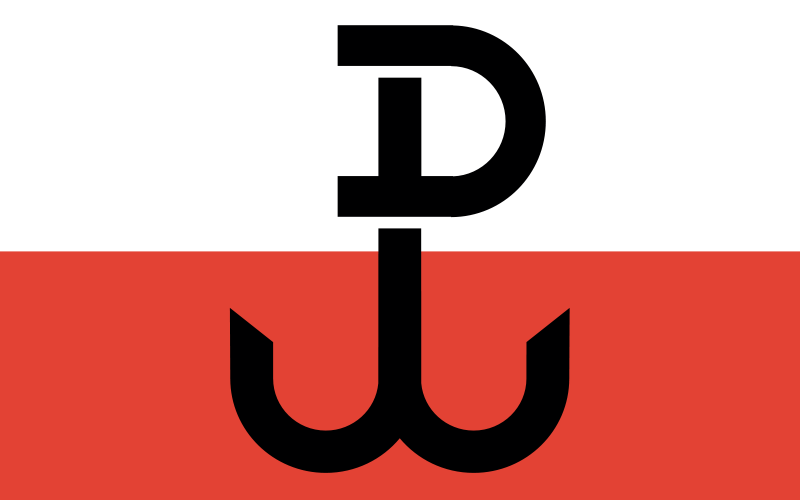 The majority of old Warsaw was destroyed in WWII, a lot of it in the Warsaw Uprising. So the city is a mix of the few remaining buildings from before WWII, a host of soviet-style buildings from the days of Communism, and the newer, more modern buildings from the past few decades. I can’t quite place Warsaw on a scale of how wealthy it is. On one hand it’s Poland’s capital and is bustling and busy. On the other, it’s a little rough around the edges. The sidewalks (at least in our neighborhood which is right downtown) tend to pool water and are falling apart. There’s lots of trash. But there are also lots of businesses. And last night we went through a modern shopping mall. There’s lots of public transportation in this neighborhood – buses, trollies, and a subway system. It’ll be interesting to learn more about the city and explore other neighborhoods. It’s also obviously a very historical city. There are plaques all over the place, none of which I understand besides the dates. The Warsaw uprising was in 1944 and I’ve noticed a lot of the plaques have those dates. 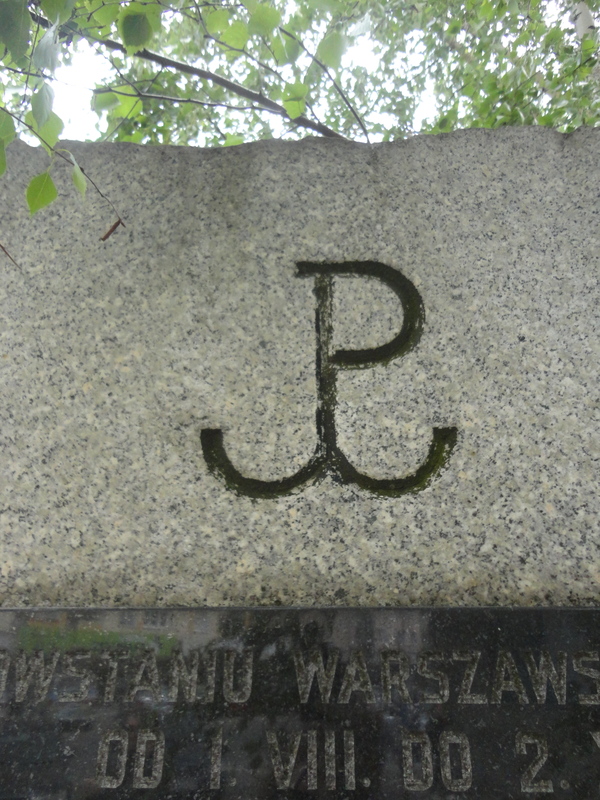 We saw this symbol all over the place in downtown Warsaw. It comes from the Resistance Army’s flag during WWII. There’s lots of graffiti. Almost all of it’s in Polish so I have no idea what it’s saying. But we found one, right down the road from the Palace of Science and Culture, that wasn’t too hard to understand (see below). What do you think? It’s pretty cool/interesting right? Ok! I haven’t seen much else and don’t really understand a ton of what’s around me yet. There are lots of kebab stands – so delicious! I’ll hopefully have more developed and thoughtful posts as the weeks go on! Lots of love from Warsaw! The symbol from the Resistance Army’s flag is great and I love that graffiti. The mix of architecture would be so interesting to see since the USA is so young and really doesn’t have a mix. I love the pictures and I am excited to hear about what you all will be discussing soon! Great pics! Glad to see that you are settling in and exploring around. I absolutely love the Resistance Army flag and what it stands for. When I visited Poland, the souvenir I chose was a patch with that symbol on it. 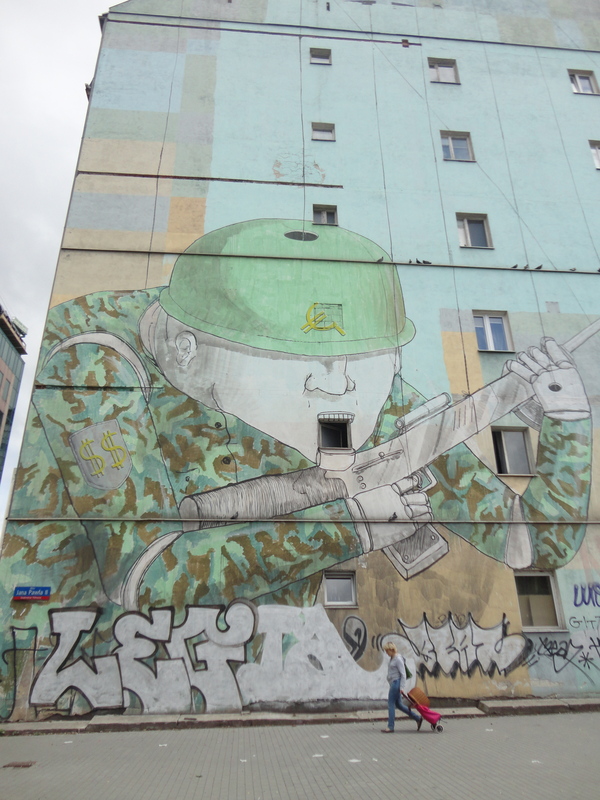 To me, it summed up the spirit of the people and history of Poland quite nicely.